Microscope eyepiece reticles with linear scales are for accurate measurements. In order to calibrate your reticle, a stage micrometer with inscribed measurements is required. Microscope eyepiece reticles with linear scales are for accurate measurements. 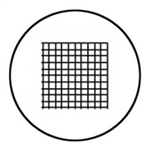 Grid microscope eyepiece reticles are 10mm square and divided into 100 squares. Each square is 1mm on a side. Microscope eyepiece reticle with solid crosshair. 19mm diameter. Microscope eyepiece reticle with solid crosshair. 20mm diameter.